Take a top. Add water, macaroni to it. Add 1 tsp of oil so that macaroni stays nonstick. Let it boil for 10-15 minutes. Once it’s boiled properly, sieve it and wash properly with fresh water. Add 1/2 tsp of salt to the boiled macaroni. Saute it well and leave for 5 minutes. Take a pan and add a spoonful of Ghee in it. Let it warm for a few seconds. Then add 1 tsp of Jeera (Cumin), Ajwain in the pan and saute it. Add onion and saute it until fry. Add tomato, boiled corn and saute it for a few seconds. Cover the lid and let the mixture covered until fry properly. Add 1/2 tsp salt, 1/4 tsp red chili powder, 1/4 tsp turmeric powder, 1 tsp Amchoor Powder and 1 tsp Garam Masala. Add cream and mix it well. Add a little water. Mix it well & cover the lid. Add macaroni and mix it well. It’s really a cool and useful piece of information. I’m satisfied that you simply shared this useful information with us. Please stay us up to date like this. Thank you for sharing. 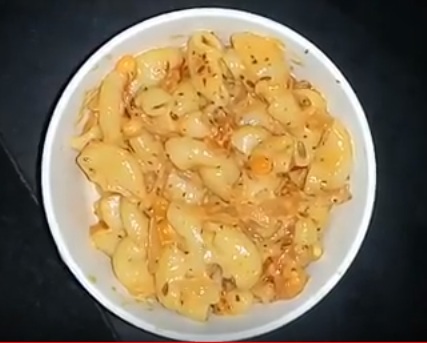 Do share pictures of the same dish prepared by you on my YouTube channel Crazy Cookery.